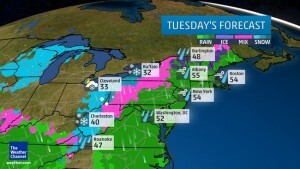 The Weather Channel Reports Winter Storm Olympia Spreading Snow and Ice Through Northeast and South including Buffalo and Rochester New York. 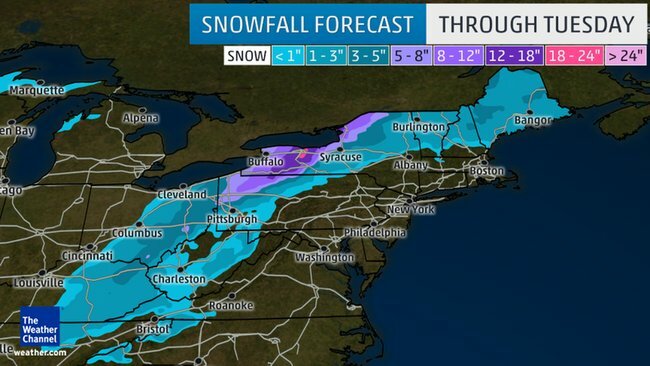 The most significant snowfall accumulations will be in an arc from northern Maine southwest along the Canadian border to western New York, northwest Pennsylvania and northeast Ohio. As colder air wraps in behind the low pressure system, some locations from West Virginia to central Pennsylvania and central New York may transition back to snow Tuesday night. The heaviest accumulations, potentially more than a foot, will likely occur in a swath from the Appalachians to northwest Pennsylvania, western New York and parts of northern New England. The Duke Company carries a wide selection of deicers, American Rock Salt (by the bag, pallet or wholesale), snow removal and construction equipment rentals (including ground heaters). Need help? Call us, our top ranked customer service will assist you with expert advice.